If an extension fails to pass, the absence of a surface transportation bill would see the loss of one million construction and related jobs, President Obama warns. Photo via the Miller Center. 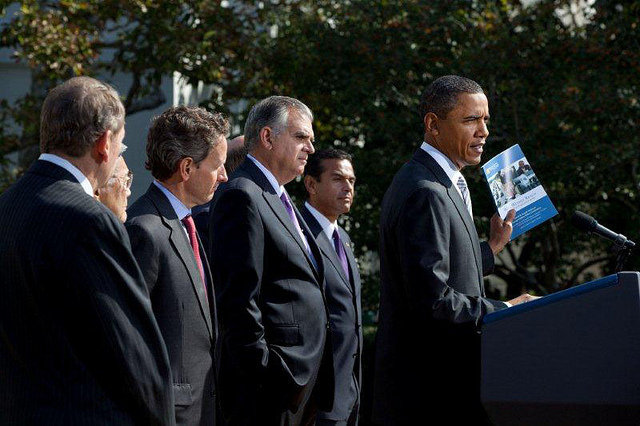 Today, President Obama urged Congress to pass a clean extension of the nation’s surface transportation bill. If not extended, the bill will expire on September 30, taking with it funding for mass transit systems, as well as shutting down bridge repair and highway construction projects. The legislation also provides funding for thousands of transportation projects that are currently under construction and authorizes the federal 18.4 cent-per-gallon gas tax. U.S. Secretary of Transportation Ray LaHood explains that the expiration of the transportation bill would cause the loss of 1 million construction and related jobs. Even a 10-day delay of the extension can cost the nation $1 billion in highway funding and furlough 4,000 professionals that work in the Department of Transportation. Read the transcript from the press conference here.